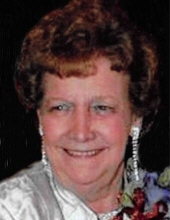 Marion Lee Dudra, 87, of Springfield, formerly of Pana passed away Sunday, March 31, 2019 at Heritage Health in Springfield. She was born May 1, 1931 in Pana, daughter of the late Edgar & Lola (Carlisle) Oliver. Marion lived in the Pana area most of her life and was a member of the St. Patrick’s Catholic Church, Pana and Pana Women of the Moose. She was a homemaker and enjoyed playing games and sitting on her porch, drinking coffee. Marion married Aloysius “Aloys” Paul Dudra on June 21, 1952 in Collinsville. He preceded her in death on July 2, 1995. She is survived by her children: Paul (Susan) Dudra, Decatur, IL & Tammy (Don) Wolters, Springfield and grandsons: Nathaniel Wolters & Patrick Dudra. She was also preceded in death by her daughter, Debbie Dudra-Robison; siblings: Leroy “Corky” Oliver, William Oliver, Gerald Oliver, Winston Oliver, Ruth Gentry, Dorothy Russell, Juanita Gordon, Evelyn Mills, Audrey Moore, Jana Faye Miller, Jerry Oliver, Ima Jean Fischer; and niece, Carolyn Henson. Funeral services will be held on Thursday, April 4, 2019 in McCracken-Dean Funeral Home at 11:00 a.m. with Rev. Rodney A. Schwartz officiating. Burial will be in Calvary Cemetery, Pana. Visitation will be Thursday from 10:00 a.m. until service time in the funeral home. Memorials in Marion’s honor may be made to the Dementia Society of America, P.O. Box 600, Doylestown, PA 18901. "Email Address" would like to share the life celebration of Marion Lee Dudra. Click on the "link" to go to share a favorite memory or leave a condolence message for the family.